San Diego is a place of sunshine and the outdoors. It’s a place to soak up some vitamin D and wander around the many beaches, nature reserves and quiet streets. I’m all about nature while traveling zero-waste and as a vegan this can seem like a daunting task, San Diego is well equipped for the challenge. I wanted to share my top tips and favorite hangouts in this guide to make sure you get more than just the typical experience. Being zero-waste means I try to create as little waste as possible when I am on vacation. Thankfully this is not too difficult in San Diego as locals are very proactive in protecting the environment regardless of if it’s the natural landscape or the ocean. Many takeout places have compostable containers, and if not, people are receptive when I bring my own containers. For restaurants with vegan options, my first recommendation is Muzita Abyssianian Bistro. It serves traditional Ethiopian cuisine and is located in a nice area to walk around, University Heights. Another option is the classic Italian restaurant Civico 1845 in Little Italy with vegan dishes and it’s also in a great place to explore. The main airport in San Diego is the San Diego International Airport and it is extremely close to the city. It’s only a 12-minute cab ride, so if there are a few of you with luggage it’s worth paying the extra for the convenience. I tend to either use a ride-sharing app from the airport, or get a taxi. I will mention that although public transport in San Diego is very minimal to non-existent, the alternative from the airport to the city is the 992 bus that leaves every 30 minutes and only costs a bit over $2. For the rest of your trip, I would recommend renting a car or sticking to a taxi app, especially if you are a bit tied for time as there are only 3 metro lines. The city is extremely large and traffic is dense at times, so expect to be doing a lot of driving to get from site to site. You can find deals for hotels ranging from $65 to $250 a night. A hotel I recommend is Lafayette Hotel, in North Park. It’s a retro-style hotel dating from the 1940s and was even used in scenes for the classic movie, Top Gun. It’s also located just 2 miles from the iconic Balboa Park which I’ll discuss in more detail below. If you have money to spare and your own transport, Hotel Del Coronado is a unique place to stay – it is part of a fancy 1888 Victorian property on Coronado Island with ocean views and only a 10-minute drive from downtown San Diego. San Diego is a city all about getting active, and with perfect weather year-round it’s not difficult to get outside. To that end, here are some of my favorite places to visit when I want to get out and moving. Torrey Pines is a favorite for locals. There are always people running, biking and hiking so feel free to join in. The park includes several easy trails with amazing panoramic views of the ocean. The nature around the walks is also breathtaking with tiny animals and a variety of plants. The reserve includes a large hill that is perfect for a sit down and enjoying the natural beauty of the surroundings. For those who want a bit more of a relaxed experience, the reserve also includes a beach. My younger sisters and I often explore the cliffs next to the shore, some of which have steps going up, if you have kids they’ll love this. Try to stay until sunset as the colors of the cliffs become vivid and are beautiful to watch. Close by is the Gliderport where you can go tandem paragliding with a pro. This is an amazing and thrilling way to get a sense of the city from above. When I went the guides were knowledgeable and funny which in turn made the thought of jumping off a cliff edge far more relaxing. Once I got in the air I was absolutely stunned by the feeling as well as the view of San Diego from the sky, I highly recommend this experience! One of my most frequented beaches is Del Mar because it’s not as crowded and there are plenty of relaxing spots on the grass or sand. Once you’re done relaxing grab a bite to eat in one of the restaurants or cafes nearby. Also, while you’re there, I would highly recommend getting surfing lessons at one of the many surf schools including Fulcrum Surf, Surf Sessions and Rusty Surfboard – after all, southern California is all about the surfing culture. La Jolla is a small beach with great marine life and amazing coves. I’ve been kayaking and saw garibaldi, yellowtail, and rays. I’ve also gone exploring in the tidepools, which you can find at the cove, False Point, Shell Beach, and between Wipeout Beach and Hospital Point. There are crabs, limpets, sea anemones, a variety of fish, sea slugs, urchins, starfish and, if you’re lucky, baby octopus. There is a huge amount of seals that you can get pretty close to by stepping out onto the rocks, don’t let the funky smell put you off! From December to May, you can see tiny newborn baby seals. 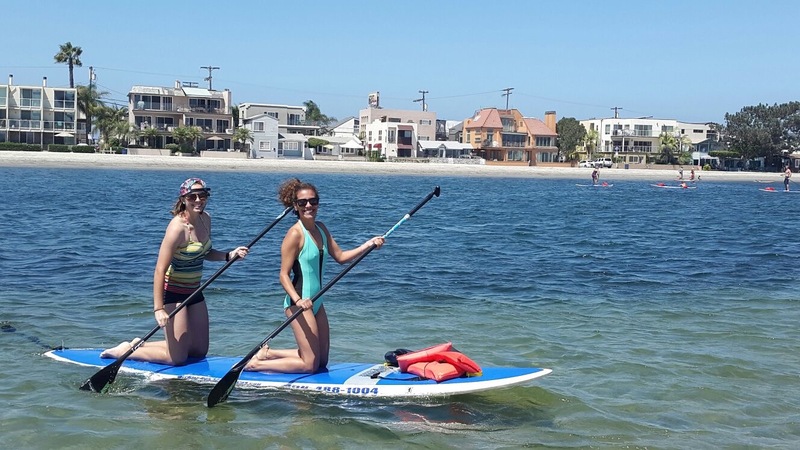 Mission Bay is another area popular with locals with lots to keep you active. It’s an area that I think it great for biking, surfing, and paddle-boarding (water skiing and sailing are also available). I have spent entire days there getting sunburned as I paddle around with friends – it’s basically a water playground for everyone. Mission Beach and Pacific Beach are connected and encompass about eight miles, making it one of the nicest stretches of beach in the city. At night, my family occasionally do beach bonfires around the Ski Beach area. Markets are often the best way to experience a local’s perspective, plus I usually like to end my day at a farmer’s market. Good news is they’re all over San Diego, but my favorites are the Carlsbad and Del Mar Farmers Markets. San Diego has a great variety of food to choose from (my favorite is always Mexican)! If you visit the farmer’s markets I mentioned you will find all kinds of Mexican food (including vegan options! ), desserts, drinks, fresh fruits, and fresh veggies. I never know what I might come across or who I might meet. After an active day the food at these markets tastes amazing, and as a bonus the vendors are always nice and talkative. Note: The Carlsbad market is on Wednesdays from 3 to 7 p.m. and the Del Mar market is Saturdays from 1 to 4 p.m. so make sure to fit in a visit! If you want to get a quick feel for the city, the Old Town Troller of San Diego (Hop on Hop off) is a fun way to get around and explore. The friendly conductors narrate this tour with a fascinating and fun mix of trivia and humorous stories which is what makes it a great experience! For culture, head over to Balboa Park. Not only is it a really nice park that the whole family will enjoy, it’s also the location to some great museums including the Photographic Arts Museum, the Natural History Museum, the Air & Space museum and the Science Museum. Check out all the attraction on Traveloris before you go, and if you think other people would benefit from this quick San Diego City Guide read, why not share it on your social media?